The health of your skin is largely a reflection of your overall well being. Genes certainly play a role as well. However, your genetic makeup has no more influence on skin appearance than on any other area of your body. Cardiovascular disease, diabetes and obesity are unlikely parallels in that they all carry genetic influences, but also respond remarkably well to natural interventions such as dietary changes, exercise, proper sleep and stress management. Your largest organ, the skin, is no different. In all honesty, I haven’t used a sunscreen or block in many years, although I have naturally fair skin, I simply don’t burn like I used to. It doesn’t matter where we travel or how much time I spend outdoors. My ardent belief is that my nutrient rich diet and individualized supplementation are the reasons for this welcome change. This is not to say that I sunbathe frequently or go out of my way to exercise outside during peak times of the day. I’m also not recommending that everyone follow my lead in avoiding sunscreen. This is a personal decision that ought to be made in conjunction with your health care team. But regardless of what you decide with regard to topical skin care, you’d do well to harness the power of antioxidant and omega-3 rich foods as part of a comprehensive approach to skin care during the summer months and beyond. Thank you, Kelly. That seems like an excellent strategy to me! Thank you, Ted. Very interesting information. They’re all well on point, IMO. Effective photoprotection of human skin against infrared A radiation by topically applied antioxidants: results from a vehicle controlled, double-blind, randomized study. 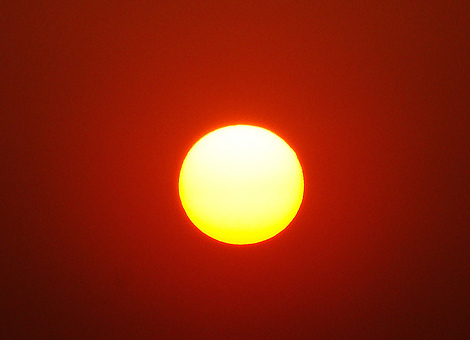 Infrared A radiation (IRA) from solar sunlight contributes to photoaging of human skin, e.g. by upregulating MMP-1 expression in dermal fibroblasts, indicating the need for photoprotection of human skin against IRA. Up to now, however, there has been no controlled study to show that effective protection of human skin against IRA radiation is possible. Here, we have conducted a randomized, controlled, double-blinded prospective study in 30 healthy volunteers to assess the capacity of an SPF 30 sunscreen versus the same sunscreen supplemented with an antioxidant cocktail containing grape seed extract, vitamin E, ubiquinone and vitamin C to protect human skin against IRA radiation-induced MMP-1 upregulation. As expected, exposure to IRA radiation significantly upregulated MMP-1 expression, as compared to unirradiated skin, and this response was significantly reduced, if the SPF30 sunscreen plus the antioxidant cocktail had been applied prior to IRA radiation. In contrast, treatment of human skin with the SPF30 sunscreen alone did not provide significant protection. These results indicate that topically applied antioxidants effectively protect human skin against IRA radiation and that regular sunscreens need to be supplemented with specific antioxidants in order to achieve IRA photoprotection. Photoaging accounts for most age-related changes in skin appearance. It has been suggested that both astaxanthin, a potent antioxidant, and collagen hydrolysate can be used as antiaging modalities in photoaged skin. However, there is no clinical study using astaxanthin combined with collagen hydrolysate. We investigated the effects of using a combination of dietary astaxanthin and collagen hydrolysate supplementation on moderately photoaged skin in humans. A total of 44 healthy subjects were recruited and treated with astaxanthin (2 mg/day) combined with collagen hydrolysate (3 g/day) or placebos, which were identical in appearance and taste to the active supplementation for 12 weeks. The elasticity and hydration properties of facial skin were evaluated using noninvasive objective devices. In addition, we also evaluated the expression of procollagen type I, fibrillin-1, matrix metalloproteinase-1 (MMP-1) and -12, and ultraviolet (UV)-induced DNA damage in artificially UV-irradiated buttock skin before and after treatment. The supplement group showed significant improvements in skin elasticity and transepidermal water loss in photoaged facial skin after 12 weeks compared with the placebo group. In the supplement group, expression of procollagen type I mRNA increased and expression of MMP-1 and -12 mRNA decreased compared with those in the placebo group. In contrast, there was no significant difference in UV-induced DNA damage between groups. These results demonstrate that dietary astaxanthin combined with collagen hydrolysate can improve elasticity and barrier integrity in photoaged human facial skin, and such treatment is well tolerated. J Cosmet Dermatol. 2014 Jun;13(2):151-7. Protective effect of red orange extract supplementation against UV-induced skin damages: photoaging and solar lentigines. BACKGROUND: Exposure of the skin to solar ultraviolet (UV) radiations causes important oxidative damages that result in clinical and hystopathological changes, contributing to premature skin aging. Hyperpigmented lesions, also known as age spots, are one of the most visible alterations in skin photoaging. Skin is naturally equipped with antioxidant systems against UV-induced ROS generation; however, these antioxidant defenses are not completely efficient during exposure to sunlight. Oral antioxidants are able to counteract the harmful effects of UV radiation and to strengthen the physiological skin antioxidant defenses. AIMS: The present study was performed to evaluate the in vivo skin photo-protecting and anti-aging effects of a red orange (Citrus sinensis varieties Moro, Tarocco and Sanguinello) extract supplementation. Previous studies showed that red orange extracts possess strong in vitro free radical scavenging/antioxidant activity and photo-protective effects on human skin. MATERIALS/METHODS: The photo-protective effects of red orange extract intake against UV-induced skin erythema and melanin production in solar lentigo was evaluated on healthy volunteers by an objective instrumental method (reflectance spectrophotometry). RESULTS: Data obtained from in vivo studies showed that supplementation of red orange extract (100 mg/daily) for 15 days brought a significant reduction in the UV-induced skin erythema degree. Moreover, skin age spots pigmentation (melanin content) decreased from 27% to 7% when subjects were exposed to solar lamp during red orange extract supplementation. CONCLUSIONS: Red orange extract intake can strengthen physiological antioxidant skin defenses, protecting skin from the damaging processes involved in photo-aging and leading to an improvement in skin appearance and pigmentation. Food Funct. 2015 Dec 21. Improvement of green tea polyphenol with milk on skin with respect to antioxidation in healthy adults: a double-blind placebo-controlled randomized crossover clinical trial. Green tea polyphenols (GTP) have been widely tested for their effects on several metabolic syndromes and degenerative diseases such as cancer, cardiovascular diseases, and diabetes. The present study was formulated to assess the physiological efficacy of green tea polyphenol infused with milk (GTPM) on skin integrity in correlation with antioxidative status in healthy adults. Forty-four healthy voluntary subjects were recruited and assigned to two groups, who drank 240 ml of mineral water mixed with either an experimental (GTPM) or placebo package (2 packs per day) for the following 6 months. The experimental group then switched to the placebo package, and vice versa, for a further 6 months, with one month of washout period in between. During the initial, 3rd, 6th, 10th, and 13th month anthropometric measurements were performed and fasting blood samples were withdrawn for various biochemical assays. Skin examination was performed at the initial, 6th and 13th month. No significant alterations were observed in any of the anthropometric measurements. Administration of GTPM significantly increased (p < 0.05) the antioxidant index and antioxidant enzyme activities when compared with the placebo group, whereas a concomitant decrease in the levels of lipid peroxidation were noted. Moreover, GTPM intake notably improved skin integrity and texture by markedly lowering (p < 0.05) skin wrinkles and roughness in elderly subjects. GTPM proved to be an effective antioxidant by lowering oxidative stress and thereby ameliorating skin texture and integrity. PLoS One. 2016 Jan 27;11(1):e0147056. Higher Caffeinated Coffee Intake Is Associated with Reduced Malignant Melanoma Risk: A Meta-Analysis Study. BACKGROUND: Several epidemiological studies have determined the associations between coffee intake level and skin cancer risk; however, the results were not yet conclusive. Herein, we conducted a systematic review and meta-analysis of the cohort and case-control studies for the association between coffee intake level and malignant melanoma (MM) risk. METHODS: Studies were identified through searching the PubMed and MEDLINE databases (to November, 2015). Study-specific risk estimates were pooled under the random-effects model. RESULTS: Two case-control studies (846 MM patients and 843 controls) and five cohort studies (including 844,246 participants and 5,737 MM cases) were identified. For caffeinated coffee, the pooled relative risk (RR) of MM was 0.81 [95% confidential interval (95% CI) = 0.68-0.97; P-value for Q-test = 0.003; I2 = 63.5%] for those with highest versus lowest quantity of intake. In the dose-response analysis, the RR of MM was 0.955 (95% CI = 0.912-0.999) for per 1 cup/day increment of caffeinated coffee consumption and linearity dose-response association was found (P-value for nonlinearity = 0.326). Strikingly, no significant association was found between the decaffeinated coffee intake level and MM risk (pooled RR = 0.92, 95% CI = 0.81-1.05; P-value for Q-test = 0.967; I2 = 0%; highest versus lowest quantity of intake). CONCLUSIONS: This meta-analysis suggested that caffeinated coffee might have chemo-preventive effects against MM but not decaffeinated coffee. However, larger prospective studies and the intervention studies are warranted to confirm these findings. Food Nutr Res. 2016 Jul 1;60:31871. Skin photoprotective and antiageing effects of a combination of rosemary (Rosmarinus officinalis) and grapefruit (Citrus paradisi) polyphenols. BMC Cancer. 2016 Jul 29;16(1):562. Coffee consumption and the risk of malignant melanoma in the Norwegian Women and Cancer (NOWAC) Study. METHODS: We had baseline information on total coffee consumption and consumption of filtered, instant, and boiled coffee from self-administered questionnaires for 104,080 women in the Norwegian Women and Cancer (NOWAC) Study. We also had follow-up information collected 6-8 years after baseline. Multiple imputation was used to deal with missing data, and multivariable Cox regression models were used to calculate hazard ratios (HR) for malignant melanoma by consumption category of total, filtered, instant, and boiled coffee. RESULTS: During 1.7 million person-years of follow-up, 762 cases of malignant melanoma were diagnosed. Compared to light consumers of filtered coffee (≤1 cup/day), we found a statistically significant inverse association with low-moderate consumption (>1-3 cups/day, HR = 0.80; 95 % confidence interval [CI] 0.66-0.98) and high-moderate consumption of filtered coffee (>3-5 cups/day, HR = 0.77; 95 % CI 0.61-0.97) and melanoma risk (p trend = 0.02). We did not find a statistically significant association between total, instant, or boiled coffee consumption and the risk of malignant melanoma in any of the consumption categories. Br J Dermatol. 2016 Sep 23. Molecular evidence that oral supplementation with lycopene or lutein protects human skin against ultraviolet radiation: Results from a double-blinded, placebo-controlled, cross-over study. BACKGROUND: Increasing evidence suggests photo-protection by oral supplementation with ß-carotene and lycopene. OBJECTIVES: We examined the capacity of lycopene rich tomato nutrient complex (TNC) and lutein, to protect against UVA/B- and UVA1 radiation at a molecular level. METHODS: In a placebo-controlled, double blinded, randomized cross over study two actives containing either TNC or lutein were assessed for their capacity to decrease the expression of UVA1 radiation-inducible genes including heme oxygenase-1 (HO-1), intercellular adhesion molecule-1 (ICAM-1) and matrix metalloproteinase-1 (MMP-1). 65 healthy volunteers were allocated to 4 treatment groups and subjected to a 2-weeks wash-out phase, followed by two 12-weeks treatment phases separated by another 2-weeks wash-out. Volunteers started either with active and switched then to placebo or vice versa. At the beginning and at the end of each treatment phase skin was irradiated and 24 hours later biopsies were taken from untreated, UVB/A- and UVA1 irradiated skin for subsequent RT-PCR analysis of gene expression. Moreover, blood samples were taken after the wash out and the treatment phases for assessment of carotenoids. RESULTS: TNC completely inhibited UVA1 as well as UVA/B induced upregulation of HO-1, ICAM-1 and MMP1 mRNA no matter of sequence (ANOVA, p<0.05). 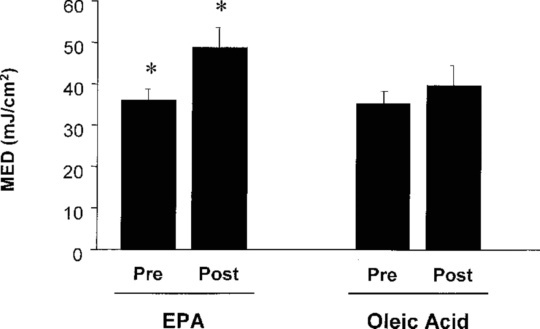 In contrast, lutein provided complete protection if it was taken in the first period, but showed significantly smaller effects in the second sequence compared to TNC. CONCLUSION: Assuming the role of these genes as indicators of oxidative stress, photo-dermatoses and photo-aging these results might indicate that TNC and lutein could protect against solar radiation-induced health damage. Photodermatol Photoimmunol Photomed. 2017 Sep 8. An open label clinical trial assessing the efficacy and safety of Bend Skincare Anti-Aging Formula on minimal erythema dose in skin. BACKGROUND/PURPOSE: Sunburn and other health risks associated with excess sun exposure place huge economic burdens on societies, and create discomfort and disease within susceptible individuals. Oral supplements that reduce sunburn may be advantageous. This study evaluated the safety and efficacy of Bend Skincare Anti-Aging Formula to ameliorate sunburn induced with a solar simulator. METHODS: Subjects (n= 28) with Fitzpatrick skin phototypes I, II or III took four capsules daily of the supplement providing 1400 mg of eicosapentaenoic acid (EPA)+ docosahexaenoic acid (DHA), 120 mg of gamma-linolenic acid (GLA), 5 mg of lutein, 2.5 mg of zeaxanthin, and 1000 IU of vitamin D3 for 8 weeks. Skin on each subject’s back was exposed to a progressive sequence of timed ultraviolet (UV) radiation exposure doses at baseline, and after 4 and 8 weeks treatment to determine their minimal erythema dose (MED). Results were compared before and after treatment using three paired t-tests and subsequently three linear mixed models. RESULTS: Treatment significantly improved tolerance to UV exposure as evidenced by increased MED at 4 and 8 weeks compared to baseline (p<0.001). This protection increased with prolonged use of Bend Skincare Anti-Aging Formula as demonstrated by progressively increased MED between baseline and 4 weeks, and again between 4 and 8 weeks (p<0.001). Nearly 86% of patients responded to treatment within 4 weeks and 100% of patients responded by the end of the study, resulting in a 39% mean increase in MED at 4 weeks, and an 84% mean increase in MED at 8 weeks compared to baseline. Treatment was well tolerated with no product associated adverse events (AE) and only a few mild and expected side effects. CONCLUSION: Bend Skincare Anti-Aging Formula safely and effectively provides significant skin photo-protection that increases with continued use. J Am Acad Dermatol. 2017 Jul;77(1):33-41.e1. The impact of oral Polypodium leucotomos extract on ultraviolet B response: A human clinical study. RESULTS: Clinical assessments and colorimetry data showed a decrease in UVB-induced changes in 17 of 22 subjects post-PLE administration; histology findings demonstrated such a decrease in all 22 subjects. LIMITATIONS: Only 2 doses of PLE were given. Furthermore, subjects with skin phototypes I to III only were studied. CONCLUSION: The results suggest that PLE can potentially be used as an adjunctive agent to lessen the negative photobiologic effects of UVB. J Heart Lung Transplant. 2018 Sep 14. BACKGROUND: Lung transplant recipients (LTRs) are at very high risk of skin cancer. Omega-3 fatty acids (FAs) are anti-inflammatory and immune-modulating and could potentially reduce this risk. We assessed the feasibility of omega-3 FA supplementation to reduce skin cancer among these patients. METHODS: LTRs aged 18+ years, at least 1 year post-transplant, were recruited from the outpatient clinic of The Prince Charles Hospital, Brisbane. Participants were randomly allocated to 4-times-daily supplements containing either omega-3 FA (3.36 eicosapentaenoic acid [EPA] + docosahexaenoic acid) or placebo (4 g olive oil) for 12 months. Primary outcomes were rates of recruitment, retention, adherence (assessed by plasma omega-3 FA), and safety. Secondary outcomes were incident skin cancers. RESULTS: Among 106 eligible lung transplant recipients, 49 consented to take part (46%) with 25 allocated to omega-3 FA and 24 to placebo supplements. Of these, 22 (88%) and 20 (83%), respectively, completed the trial. After 12 months, median plasma EPA increased substantially in the intervention group (125.0 to 340.0 µmol/L), but not the placebo group (98.0 to 134.5 µmol/L). In the intervention group, 6 patients developed skin cancers compared with 11 in the placebo group, giving an odds ratio (95% confidence interval) of 0.34 (0.09 to 1.32). There were no serious, active intervention-related adverse events. CONCLUSIONS: This pilot trial among LTRs showed acceptable recruitment and high retention and adherence. We demonstrated a signal for reduction of new skin cancer cases in those taking omega-3 FA supplements, which supports the notion that a larger, more definitive trial is warranted. Skin Pharmacol Physiol. 2019 Mar 5;32(2):101-108. Tomato Phytonutrients Balance UV Response: Results from a Double-Blind, Randomized, Placebo-Controlled Study. BACKGROUND: Our previous double-blinded, placebo-controlled cross-over study indicated that a nutritional supplement named lycopene-rich tomato nutrient complex (TNC) can protect from UVA1-induced (340-400 nm) and UVA- (320-400 nm)/UVB-induced (280-320 nm) upregulation of molecular markers associated with oxidative stress, inflammation, and ageing. OBJECTIVES: in the current double-blind, randomized, placebo-controlled multicenter study, we analyze whether a similar, synergistic carotenoid-rich TNC can protect from broadband UVB-induced threshold erythema formation assessed as increase in minimal erythemal dose (MED) reading, the intensity of erythema formation, and the upregulation of molecular markers associated with inflammation and immunosuppression, and whether this correlates with carotenoid blood levels. METHODS: One hundred and forty-nine healthy volunteers were randomized to two groups and subjected to a 5-week washout phase, followed by a 12-week treatment phase receiving either 15 mg lycopene, 5.8 mg phytoene and phytofluene, 0.8 mg β-carotene, 5.6 mg tocopherols from tomato extract, and 4 mg carnosic acid from rosemary extract per day or placebo made from medium-chain triglycerides. At the end of each phase, MED determination, UVB irradiation, chromametry, biopsies, and blood samples were undertaken. RESULTS: The active supplement was well tolerated. Interestingly, no significant difference was seen in the MED between the active-supplement and placebo groups, as determined by visual grading by expert assessors. Of note, the carotenoid-containing supplement significantly protected against UVB-induced erythema formation measured as Δa* after the intervention minus Δa* after the washout phase as compared to the placebo. Moreover, intake of the active supplement significantly protected against UVB-induced upregulation of IL6 and TNFα as compared with the intake of placebo. Lastly, carotenoid plasma levels were significantly increased. CONCLUSION: This well-tolerated carotenoid-containing supplement significantly protected against UVB-induced erythema formation and upregulation of proinflammatory cytokines in healthy volunteers.